Adobe said India ranks among its fastest growing regions with strong growth coming across segments, especially small and medium-sized businesses (SMBs). New Delhi: Adobe, known for softwares like Photoshop and Reader, today said India ranks among its fastest growing regions with strong growth coming across segments, especially small and medium-sized businesses (SMBs). "India for us is among the fastest growing regions and we are very optimistic about the growth in the SMB segment, Besides, we are also targeting consumers like students, teachers and photographers among other to adopt CC offerings," Adobe Managing Director South Asia Umang Bedi told PTI. For the first quarter of 2014 fiscal ended February 28, 2014, NASDAQ-listed Adobe reported revenue of USD 1 billion, of which Asia-Pacific including India, was USD 163.7 million. The US-based company has offices in about 34 countries spread across North America, Asia, Australia and New Zealand, Europe, Middle East, Africa and South America. Giving a breakdown on the SMB market, Bedi added that out of the total segment, the addressable market for the firm is about 10 million of which about 5 million have a PC. "We are very optimistic about this segment and adding individual consumers like student-teachers and photographers to it, we think we have a great going ahead. We have really worked on out prices and made them highly competitive. Its like a total mind shift for us," he said. Buoyed by the response to its Creative Cloud offering, the US-based firm today announced 14 new versions of Creative Cloud (CC) desktop applications, which includes tools like Adobe Photoshop CC, Adobe Illustrator CC, Adobe Dreamweaver CC and Adobe Premiere Pro CC. It is the biggest Adobe software release since CS6, which also includes four new mobile apps, updates to CC services and new offerings for enterprise, education and photography customers. 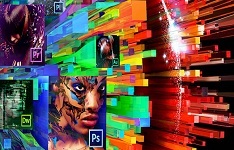 Yesterday, Adobe announced it has more than 2.3 million Creative Cloud subscriptions globally. According to the firm, it had 1.844 million CC subscriptions at the end of Q1 2014. The industry is dealing with a rapid pace of change, an explosion of mobile and working in a super-connected world, Bedi said adding the 2014 release of CC gives the users a range of new mobile apps and a host of tightly integrated cloud services. Further expanding its strategy to reach out to individual consumers, Adobe today also announced availability of the new Creative Cloud Photography plan, which is designed for anyone interested in photography. The new plan brings together -- for Rs 499 per month -- Photoshop CC and Lightroom 5, two tools that have been a hit with photographers and Lightroom's breakthrough mobile apps on iPad and now iPhone. Also introduced today was the all-new Photoshop Mix, a new iPad app that provides access to powerful Photoshop features normally confined to the desktop, enabling compositing and transformative edits while on the go.